Wet-fold realistic 3D bats for Halloween! Michael LaFosse has a video demonstration at the Peabody Essex Museum's origami site. To get to the bat video, click "Fold more models," then "Origami Now" and you'll see the "Happy Goodluck Bat." (They will ward off the zombies and vampires that might try to get you.) Click the bat picture. Even if you don't make any bats yourself, it's mesmerizing to watch an expert do origami. He makes it look so easy, with none of the consternation, fumbling, and frustrated sighs I like to incorporate into my origami attempts. Hey, that reminds me. I ate bat once. We met a Tibetan couple at Kinkos a few years ago, and they invited us to a Tibetan celebration. Fun. Then they invited us to a barbecue in their back yard, where they grilled lots of interesting things. I was offered a charred thing with tiny bones and not much meat, which our friend said was bat (purchased in Chinatown). It tasted like chicken. I know! The wet-folding link has some info about paper types (including a common Canson watercolor brand), but I wanted Mr. LaFosse to say, "This is XYZ paper that I bought at ABC place." The narwhal is AWESOME, too, but definitely NOT for beginners. For beginners and those folding for small children, try the penguin. He uses "story-gami" to demonstrate it, making it much easier to remember the method. Fun tutorial! I'm sure that I would be fumbling, too. I love these!! I can't get the video to play all the way through and it's killing me!! I made a lotus using this site. Not too shabby considering I used office paper. :) Not even going to try the bat. My lotus doesn't look perfect, so I would hate to see what my bat looked like. Well, I think mutant bats would still say "Halloween." Okay that is awesome. I'm trying this. I love an origami challenge. And congratulations on Blogs of Note! Um, thanks! What's Blogs of Note? I believe you can find it on a tab on your Blogger dashboard. Origami" is one of Japan's unique traditional arts. I have been familiar with origami since my childhood. "Happy Goodluck Bat"is so cute! Your blog has a great look ! 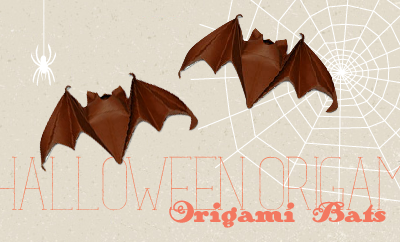 I really love these bats - though I don't think my origami is up to doing them justice... anyone else tried yet? I love Halloween stuff. Very fun. I'd love to make a bunch of these and string them up on a garland! I'll try making one when I get home and see if making multiples will be feasible, or even possible! I was hoping the instructor described the type of paper in the video. It looks like I may have to experiment a little bit. Thanks for the link! This is long but names a couple sources for paper...including Michael LaFosse/Origamido Studio. As of now, I've got a plain white origami bat keeping me company in the office. Love it! But it took a lot of skipping back and rewatching to do it. Did it with a thinner, dry paper btw. Works, but it won't harden. Cool: Casey Starks just shared some newly folded bats with me on Twitter. Have a peek! I should have seen this before halloween. What a great work!